The rescue team rescued 45 Tamil Nadu fishermen today who were stranded in the middle of the deep sea near Lakshadweep. Indian Navy told these fishermen are safe at Kochi now and they will return to their native land soon. 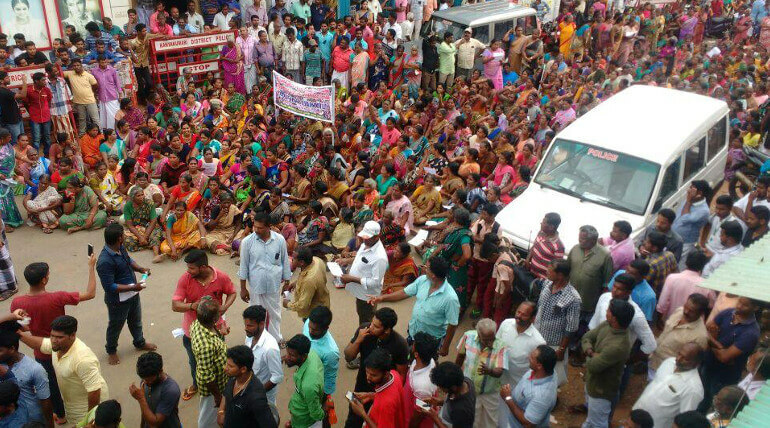 Meantime fishermen families are still continuing their protest in Kanyakumari demanding to find their loved ones soon. Still more than 1000 fishermen are missing who left shore before the Ockhi cyclone. They are demanding the government to make rescue operation most responsive and wanted Chief Minister Edappadi Palanisamy to meet them. In Kerala, Chief Minister Pinarayi Vijayan had announced 20 lakhs to each fisher man family who died in this cyclone. It is reported about 500 fishermen are missing in the state. He is meeting the affected people and receiving their memo. Kerala CM is set to fly to Delhi to claim the fund for Ockhi cyclone affected areas. Tamil Nadu People curse their CM as he has no time to visit the people affected and busy asking voted in RK Nagar.